Heather / Bell Heather Distribution on the Project Site. Heather (Calluna vulgaris) and Bell Heather (Erica cinerea) both occurred in all of sections 5 - 9. While they occurred in the same sections, they reached their greatest abundance in quite different areas. 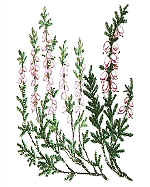 Heather was most abundant in section 9 (see above), while Bell Heather was most abundant in section 5, the control section (see below). The reasons for these different distribution patterns are unclear, and appear to be environmental rather than as a result of differing management techniques. Heather is able to grow in a wide range of heathland soil types and conditions and is much more flexible in its requirements than Bell Heather. Bell Heather is generally confined to the driest parts of the heathland because germination and establishment of seedlings is poor in water logged or peaty soils. Sedges are most common in the areas of sections 7 - 9, which may suggest that the soils are less well-drained in this region. This may explain why Bell Heather was rare in section 9. Its rarity in section 6 was possibly a result of the frequent cutting which takes place in this section (3 times a year). Bell Heather also requires deeper soils than Heather, which may affect its distribution on the project site. Bell Heather occurs as neat, compact plants. It does not form the dense uniform stands which are characteristic of Heather. The stems of Bell Heather are more slender and less woody than those of Heather. When growing amongst Heather, Bell Heather is weaker and more straggly and may rely on the more robust Heather for support (Webb 1986). It is interesting to note that Bell Heather was found growing at heights of approaching 1 metre in the control section in 1998. The plants were reaching these heights by using gorse bushes for support.